As Q said either for the brow trim is acceptable, I based my one off the second helmets in on the last photo as I didn’t like the straight edge ones, with the tube strips I was told to use a HB pencil width for the gap from the tube ridge to the top of the stripe, either way as I said pick a screen helmet from the photo library and go with that you can’t go wrong. Don’t butcher the elastic push the over as much as possible and then just add a dab of E6000 behind the elastic and clamp it in place to align the boxes up with the end of the belt. Hi Jennifer, good choice on the RS kit they are a good looking kit once finished. 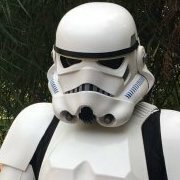 What I would do is restart your build thread on the ANH build thread section, if you haven’t done so already look up Crickets build thread or franks or reach out to them for help as there is a Facebook group for you are too short for a stormtrooper. Also stay away from the heat gun, use boiling hot water method it’s safer for your armour and it heats the ABS evenly. Mworm1974 replied to NoZoupForYou's topic in Newly Approved Members - Sound Off! Well done Iden is proud of you! What most people do is find a screen used helmet and model theirs off that, the photos that Q posted are a good reference, then you have a reference point. Mworm1974 replied to TK29912's topic in Newly Approved Members - Sound Off! Well done trooper, go and serve the empire with pride! Nice job on your kit, just one thing with the brow trim, the ends could be cut to align at an angle with the traps like in the photos of the screen used helmet, also just watch your sniper knee as it appears very close to the thigh and could get caught under it if the thigh drops. Well done trooper, go and make the empire proud! 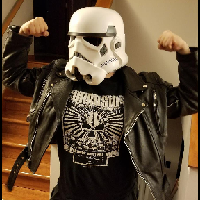 TK 30005 reporting for duty!!! Mworm1974 replied to johnnycano's topic in Newly Approved Members - Sound Off! Awesome kit trooper you will make the first order proud! Good work, I had the same issue with my forearms too, use 2 or 3 fingers to measure the gap between the bicep/forearm and forearm/hand guard. Awesome photos and job well done, this is what it’s all about.